Michelle S and Mhairi headed out to Guildford last night for the town centre crit. This was a LWCR league race which also took in cobbled section. Mhairi decided that she would try get to the front from the off as it is a tight fast circuit that gets strung out quickly. She got an ok start but already after the first corner was far back and the front riders were on the next corner about 50m away. So she threw herself round the corners and on the first time up the cobbles through the finish line she put the hammer down to move up. She kept going and on the second time round she just went right up the line to the front. It turned out this was a good plan as already within a few laps the field was decimated and soon realised there were only 6 left. Then there were 4, then there were 3. It was super fast, 55s per lap! She used attack as the best form of defence and attacked downhill into the tight corner to make a gap so the other two couldn’t attack on the uphill cobbles. This worked well and she hung on. One rider started attacking about 10 mins from the end and Mhairi just closed them down gradually. 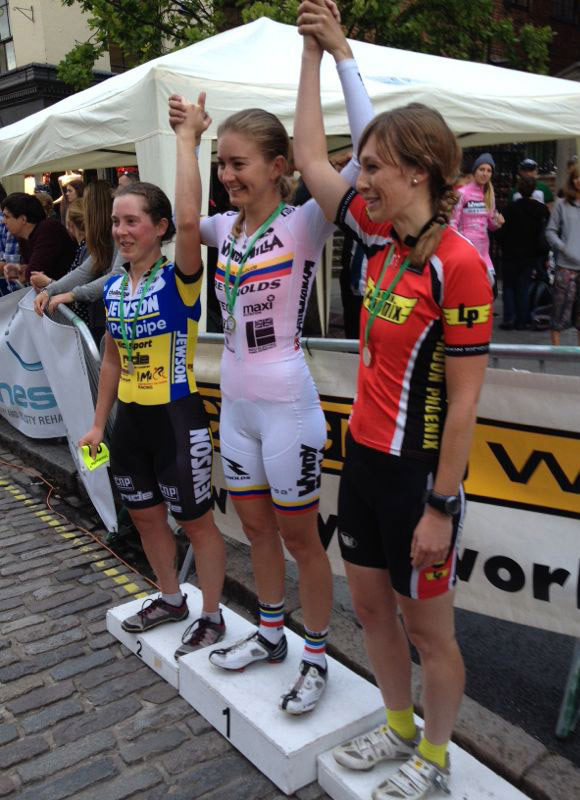 The same rider attacked on the bell and Mhairi couldn’t make it back, but came in 3rd. Michelle was on the wrong side of the splits early on but then stormed through the field picking riders off all the way managed to get her way back into the group. This ended in a bunch sprint with Michelle bagging 11th or 12th.